720 Crestwood, 2.5 acres, picnic shelter area & pedestal grills, and playground for children. 601 Van Buren and Southern, 5 acres, picnic shelter area & grills, playground, multi-purpose grass area, and restrooms. Benches, ball fields, and basketball court. 3333 & 3345 Harrison, and Beverly. 41 acres, administrative offices, 3 horseshoes pits, 2 basketball courts, soccer fields, 4 tennis courts, 2 racquetball courts, 7 softball fields, volleyball, community center facilities, running trail, outdoor picnic shelter areas, tables & grills, 2 playgrounds, restrooms and a swimming pool with water slide. 2201 Detroit Ave. & Fairgrounds, 11 acres, picnic shelter area & grills, playground, frisbee golf, soccer fields, skateboard park and restrooms. Grandview and 324 Gold Street, 3 acres, 25 meter swimming pool, wading pool, mini-slide, and restrooms. 421 Golconda & 4th, 2 acres of picnic area & grills, playground, basketball court, horseshoe pit, picnic shelter and historic "Hubbs Home". 2201 E. Andy Devine Avenue, 9 acres of picnic area & grills, multi-purpose field, large and small dog parks, and restrooms. Who is Lewis Kingman? 310 W. Beale & 1st Street, 7 acres with a display of a historic railroad steam engine and a caboose. 315 W. Beale & Grandview, 4 acres with picnic area & grills, playground, stage area, and restrooms. 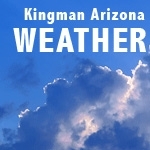 209 Mohave and Center Street, 2 acres with picnic shelter area & grills, playground, and basketball court. 2199 Pawnee Dr. & Southern, 3.2 acres with picnic shelter area & grill, playground and grassy area. 1001 Buchanon  1200 Block of Topeka, 51 acres with 6 Multi-purpose fields - including soccer, baseball, softball, football, picnic tables and playground. 3851 Willow, 4 acres with 3 picnic shelter areas, barbeques, horse shoe pit, picnic tables, playground, basketball court and restrooms. 1001 Gates Avenue with driving range, cart & club rentals, pro shop, and restaurant. It is open 7 days a week, call 753-6593 for tee times. 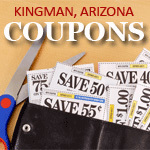 Our lists are only the highlights of things to do when you live in Kingman, Arizona. 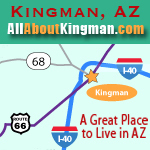 Come live in Kingman. You and your guests will have plenty of places to go and things to do!